When can I start getting excited about this? Check out story acceptances on the Crimewave section of the site. Seven so far, at least that Andy is prepared to tell us about. Saw the tantalizing Issue 11: Ghosts coming soon ad in Black Static...very excited. And with a title like that should we expect a Static-esque skew on things? When will it be available to order through the shop? I notice from the ad in the latest Interzone that it has a release date. You can subscribe to Crimewave at any time. Especially now. can't remember if i asked before - but can you buy Crimewave singually? I hadn't thought about doing that, it's always been by subscription with just one exception, not counting back issues. 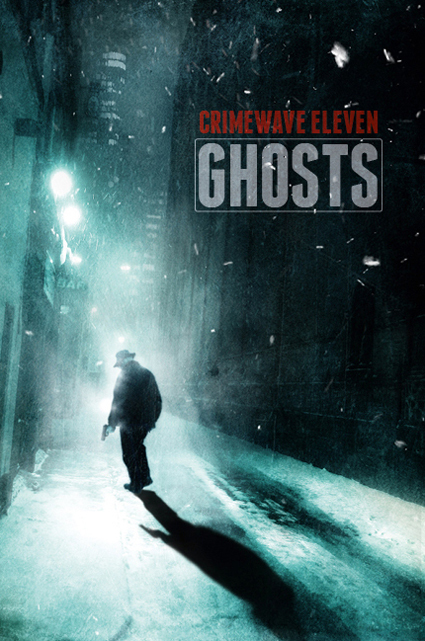 Crimewave 11: Ghosts is, like previous CWs (and Alison and Islington Crocodiles), a large format paperback (American Royal and not Demy which I've described it as previously -- Demy is slightly smaller), this one of 240 pages on good volume cream bookwove, with colour laminated cover. It is litho printed, not digital. A subscription gets this for about six quid, post free. Sounds like a bargain to me. I hope to be able to send the issue out with Black Static 20, on or about or most likely before December 12th. Will update website soon. How many issues are subscribers entitled to? I subscribed a while ago and received two so far. Looking forward to this one. Here's the front cover, art by Ben Baldwin. It might be worth remembering that although Crimewave is a serial, with ISSN, each edition is an anthology in its own right, with its own subtitle and ISBN. Should I add CW11 to the shop as well as the four-issue subscription? Would you be more likely to buy CW11 by itself than subscribe, even though the single issue might cost nearly twice as much as the subscription copy?